The sleepy Lao village of Ban Hat exists today much as it has for decades. Village children dart amongst their families’ fishing boats, laughing as they splash one another with the muddy water of the Mekong River. Life is defined by the ebb and flow of the Mekong, which ushers in fish for families and nutrients for crops and pools in flooding cycles essential for rice production. This source of subsistence could soon be threatened, however: The Lao People’s Democratic Republic (Laos) recently took steps to begin construction on the first of 12 proposed hydropower dams on the Mekong. While these projects could bring much-needed revenue to Laos and its neighboring Southeast Asian countries, they would irrevocably alter the characteristics of the river, impacting everything from fishes to flooding. And the dams’ most significant costs would be shouldered by those who can least afford it, some experts say — especially poor villagers in small riverside communities like Ban Hat. Laos’ proposal to build a dam in Sayaburi Province, in the middle stretch of the Mekong, has provoked a lengthy debate. Viraphonh Viravong, director of the Lao Department of Electricity, believes the project will bring many benefits to his country, although he admits a serious risk is posed to fisheries. Researchers’ concerns extend beyond fisheries, however. The dams “will have profound . 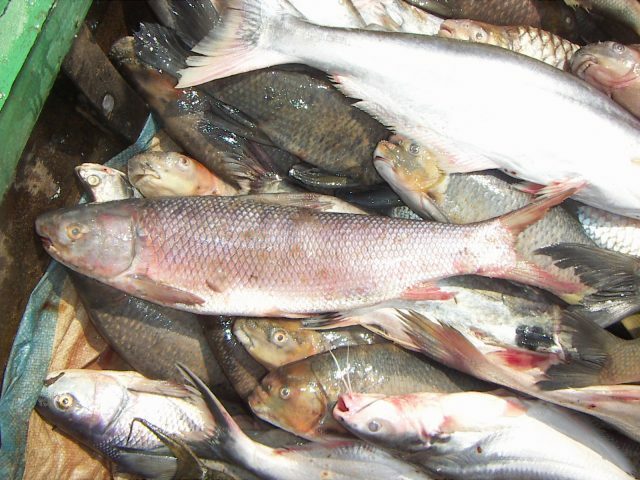 . . negative consequences for people, agriculture, fisheries, and riverine ecology,” said Smithsonian Tropical Research Institute research associate Tyson Roberts who has studied Mekong fishes for over 40 years. “For reasons I have not quite fathomed, engineers are often ignorant when it comes to ecological impacts of hydrodams,” he said. As one of the world’s last remaining large rivers free from mainstream dams for most of its 2700-mile length, the Mekong continues to harbor a rich diversity of animal species such as the critically endangered Mekong giant catfish and Irrawaddy dolphin. Although the Mekong ranks as the 10th longest river in the world, its biodiversity of species is trumped only by the Amazon River. With an estimated annual harvest of approximately 2.2 million tons of fish, the Mekong, which flows through China, Burma, Thailand, Laos, Cambodia and Vietnam, also ranks as the world’s largest inland fishery and impacts the livelihoods of the nearly 30 million people who live within 10 miles of its lower stretches. Initial assessments suggest that Vietnam could actually face substantial losses if upstream countries like Laos decide to dam the river, said socio-economist John Sawdon of the independent public interest organization the International Center for Environmental Management based in Hanoi, Vietnam. Although economic benefits are attractive for “cash-strapped” governments, he said, profits and energy benefits would be unevenly distributed, both between and within countries and particularly to the poor. Baran states that there is “absolutely no hope” for the survival of already vanishing long-distance migrant species such as the Mekong giant catfish if dam construction proceeds. Up to 70 percent of fish species in the Mekong migrate long distances to feed and spawn, and dams would both physically block their upstream journey as well as change the environmental signals that trigger migration, Baran explained in a paper published in the environmental journal AMBIO last June. Fisheries in the Mekong have already been declining over the past decade, according to Philippe Cacot, a fish propagation researcher at the Center for International Research in Agricultural Development in Montpellier, France. This decline — a result of overfishing and environmental degradation — will only get worse if the dams are built, he said. The river’s flow will also be impacted, said Cacot, which is especially problematic for communities in Vietnam’s Mekong Delta. Altering the Mekong’s flow could have a disastrous effect on agriculture. Any change in sediments and nutrients transported by the river — no matter how small — can change rice yields, Cacot explained. Manipulating the river’s flow could also allow for salt-water intrusion in the Delta, another major threat to agriculture. Some organizations are working with the Lao government to assess the risks and offer scientific advice. The Mekong River Commission (MRC), created in 1995, researches sustainable development options for its national members — Thailand, Cambodia, Laos, and Vietnam. An independent Strategic Environmental Assessment (SEA), commissioned by the MRC and published in October 2010, pointed out that one dam across the Lower Mekong mainstream would cause irrevocable change. Even with mitigation measures, according to the SEA report, dam projects would “fundamentally undermine” the Mekong’s resources, represent a “global loss” in biodiversity through extinction of endangered species, and worsen poverty in already poor communities such as Ban Hat. By 2030, if all 12 proposed dams are built, between 550,000 to 880,000 tons of annual fish catch will be lost, said Baran and a team of 25 international scientists involved in SEA. The assessment concludes by calling for a 10-year construction deferral to allow for further study. According to Hacker, the next six months will determine the future of the river as member country representatives meet to weigh the pros and cons of the dam project, although at this point it’s too early to tell what that decision will be. The MRC provides advice, Hacker said, but the member countries will come to their own final building decision together. If damming proceeds, the unmitigated risks described in the SEA assessment would result in “a permanent and irreversible loss of environmental, social, and economic assets.” The true extent of these hidden costs will only be revealed if building proceeds, at which point the damage would have already been done. And while others reap the benefits, communities such as Ban Hat would primarily shoulder this burden. Yes, as writing in this article the impact of any dam have both positive and negative. If the benefit of construction of this dam is to gain more than to lose then the project should have a green light. In contrast if the impact to the environment and the way of life of people along the Mekong river is threatened then more investigations are needed to find out the suitability of the project. I am concerning for people who live along the river side will get into trouble with their livelihood, food, and shelter. To address those imbalance things, do any governmental organization have been thinking for the victims? Do any jurisdiction urge to stop building dams? What are their opinions and suggestions to convince companies that has been built several dams along the Menkong river? Climate change may lead to water and food shgroates in countries such as Singapore. Lao, on the other hand, with its size and rich natural resources, they are likely to withstand any negative impact, if any. Singapore migration policy seems ignoring this x-factor (i.e. our climate has changed, the earth is sick and the sea level is rising… ), and we shall witness its adverse impact in he near future. Bearing in mind that we did see war refugees in the past, and we may see ‘climate refugees’ in the near future, should corrective measures not taken to save our earth. Aren’t there other alternatives, such as solar, which could be used in lieu of hydropower? Sure the amount generated would not be the same but couldn’t that be considered as an alternative that would maintain the integrity of the mekong and provide additional electricity? Is that not a win-win situation?